Antique Reproduction Faucet Singles Set has porcelain lever handles that read 'hot' and 'cold' in black lettering. Our faucets are constructed with high quality, low lead brass. Our lavatory & kitchen faucets are lead free per California AB1953. They meet all current regulations with regard to lead composition. 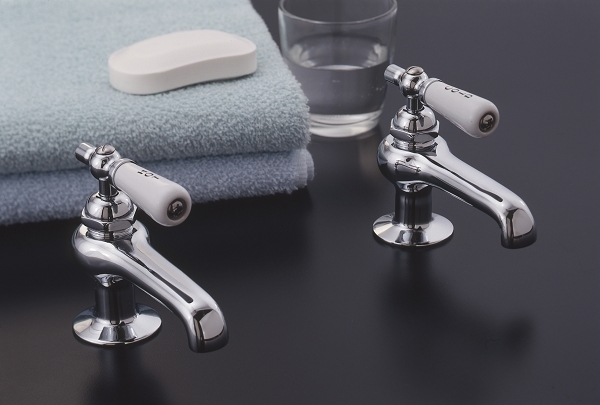 All faucets feature 1/4-turn ceramic valves, which consist of 2 ceramic disks that rotate to open and close the valve, minimizing mechanical wear. Maximum counter thickness is 1 1/2 inches. Includes supply nut/washers and lock down nuts. Available in your choice of Chrome (shown in image), Lacquered Brass, Polished Nickel, Matte Nickel, or Oil Rubbed Bronze finish.